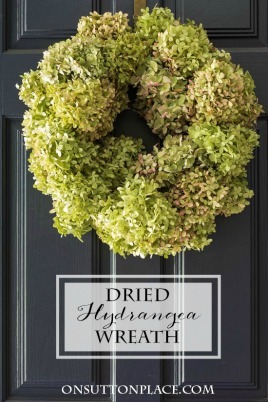 Drying Limelight Hydrangeas: the best way to harvest and dry limelight hydrangeas for arrangements, a dried limelight hydrangea wreath, or fall decor. 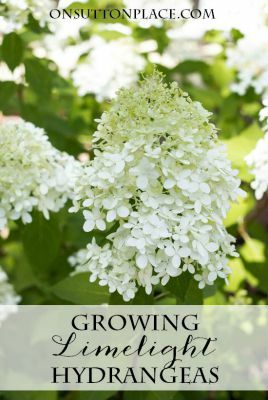 Several weeks ago I shared what I have learned about growing limelight hydrangeas. I have just three bushes that are two years old. They have produced the loveliest and most abundant blooms of anything I have ever grown. 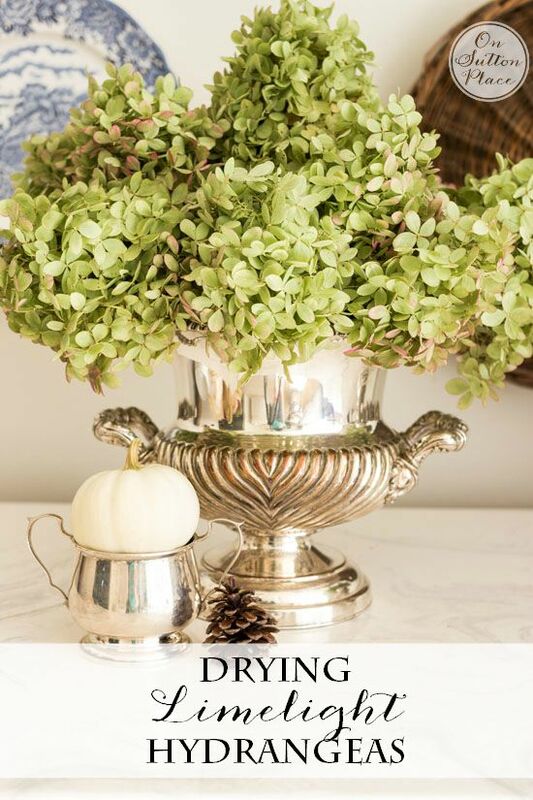 Growing limelights is easy but drying limelight hydrangeas is even easier. My best advice is to let Mother Nature do all the work. Let the blooms dry right on the bushes. They may weigh the branches down a bit but as long as they are not laying on the ground they are OK. Mine survived through high winds and very hard rain. It’s best to wait until the blooms have darkened to green and have a paper-like appearance. The longer you wait, the better. I harvested mine a few days ago and here is my first project. 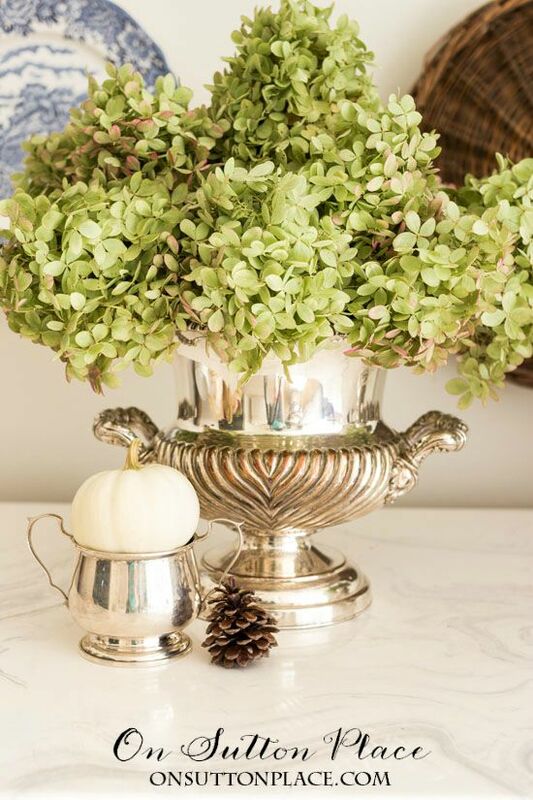 I used my twin silver urns to make dried hydrangea arrangements. You can use this method with any sort of container. Bowls, pitchers, pots…anything will work. The first thing I did was quickly and naturally clean the urns. To assemble an arrangement, here is what you need: dried limelights, container, floral styrofoam, scissors, a knife, a hole punch. Floral styrofoam comes in all shapes and sizes. I bought these squares because they were the right height. I used a serrated knife to shave off the corners so they would fit snugly in the urns. It’s perfectly fine for the styrofoam to stick out of your container. The flowers will cover it up. Next is adding the blooms. The stems of the hydrangeas are sturdy but it’s still hard to push them into the styrofoam. Use the hole punch first to make the job easier. Simply poke it into the styrofoam and then insert the trimmed stem of the bloom. Make your arrangement big and fluffy or a little more controlled. If you put a stem in and and don’t like it, just take it out and put it someplace else. I promise you cannot mess this up! I hope you aren’t tired of wreaths because I really want to see if I can make one with dried hydrangeas. If it turns out OK I will share it. I’ll be back this weekend with more of my living room refreshed for Fall. Thank you for stopping by…see you soon! Click the images below for more on limelights! Ann your wreath looks lovely. I can just imagine the mess making it! . I put a small hydrangea plant in a barrel in May & it is now full. The blooms have gone a deep pink. Here in England we are told to leave them on the plant to protect it from frost. But I think I will cut them & bring indoors. I only have a small yard here with container plants.. I had a proper garden in my last home & had a huge hydrangea bush which was much admired. I was devastated to see that it had been completely dug up. Another ex neighbour told me to let it go that it was no longer my house. But I was upset & still can’t understand why they did it! A beautiful wreath it is!! I bought my first Hydrangea plant this summer and the flowers were a beautiful blue. I hope it survives the winter and returns to me in the spring!! Thank you for all your advice on such a beautiful plant! So, I’ve added “Limelight Hydrangeas” to my mother’s day list for 2016. I’ve been wanting to plant/grow hydrangeas and now that I’ve seen how lovely they are dried, I’m sold. Thanks for the inspiration! pretty, practical,, and easy to follow. Well now I’m embarrassed I just re-read the blog and there’s the instructions for drying them. Sorry. I love hydrangeas but I haven’t had any luck growing them! I have to try again I love them! Thanks for the drying tips! Love this arrangement. I have 2 very large bushes of the limelight and I have been meaning to do an arrangement with them, you have encouraged me to get busy and do it. Thank you so much, I love your site. You still have time depending on where you live…if you are in the south you should harvest soon. If a cooler zone you probably have a few more weeks! Ann I love your blog! Thanks for the update on the lime hydrangras. Are all the containers silver? What are the small containers? Are they silver? Family pieces? Where should I sear h to find them? Hi Nan! Yes the containers are silver and are from my husband’s family. I see silver at my antique mall but it’s a bit pricey. The best places to find it are thrift stores and eBay. I see silver at my Goodwill for just a few dollars. It blows my mind. People give it away though because they don’t want to clean it. If you have an eBay acct. just search using the search bar. I just put in “vintage silver pitcher” and over 1000 listings came up. Watch for listings with free shipping. Good luck! I live in MN and have three annabelle plants. Sometimes I cut them when a light golden color sometimes when they are light green. With our weather I dont trust drying them on the branchs. I use a tall wide mouthed vase to put them in once clipped. I keep them in my basement until dry. I also have hung them from the ceiling beams in my basement. Hope this helps. Thanks June! I live in the UK, so I don’t think drying them too much is an issue. Ha ha! Sue…June’s advice about a wide mouthed vase is perfect. If you do hang them, don’t bunch them together or they will sort of mold. Thanks for this idea. 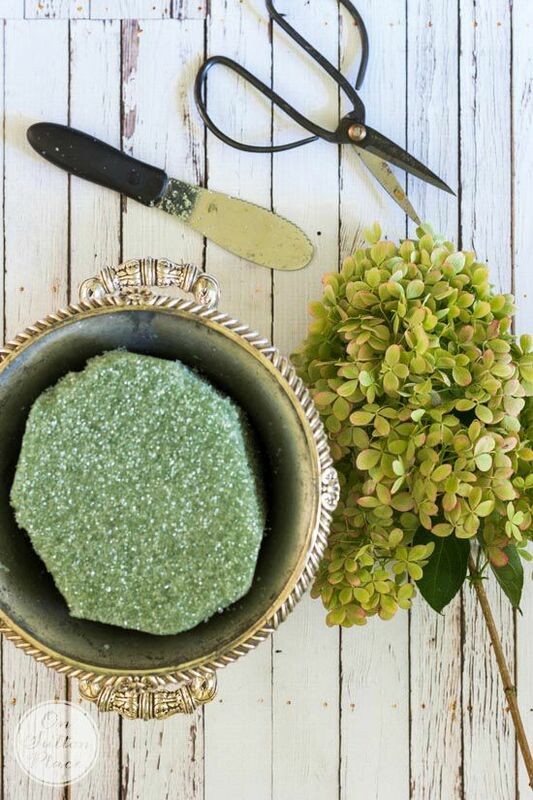 I cannot believe I’ve never thought of using foam to stabilize my hydrangeas! My limelights have done so well since they were put in 3 years ago. This year there were prolific blooms!! Followed you for about a year now,love all your ideas.I cut mine at different times & dry them by putting in a vase of Water,keep adding water till they dry.Have done this for several years. Thank you Margie! Thanks for taking the time to comment and for following along! I let mine dry on the plant but they certainly don’t look as beautiful as yours. The blooms get all shriveled. I’m wondering if it’s because of the climate here in hot, central CA. Mine is a limelight my Mother planted in her yard and when she passed two years ago, I transplanted it to my garden. It had beautiful blooms on it this year. Yes Peggy it just might be he heat. I’m not sure but that makes the most sense. Great post, Ann! I have a question about preparing limelight hydrangeas for winter. If we cut the blooms now, are we trimming branches to the ground? This is my first year having one of these beautiful plants & I don’t want to kill it! How do you leave your hydrangeas over winter? Love your blog! Hi Karen! To be honest I am not 100% sure. Everything I have read says to cut them back in late fall or very early spring. Last year I did not cut mine back except where I cut blooms. This year my bushes were top heavy because the blooms came out from the top. When I cut these blooms I went as far down to the root as I could. I did what is called a “hard pruning.” I read that this is fine but the following year your blooms might be smaller. Since your bush is on it’s first year perhaps just lightly prune the longest branches and see what happens? Sorry I am not more help but I am learning as I go. Thank you! They look great Ann! Just cut my Annabella this week too. I dried them outside on my porch and they took on the loveliest antique bronze color. Never did it that way before, always dried them up right inside. Therefore they were lime green. But I love the change and plan to use them in my fall front door swag. Can’t wait to see your house decorated for fall !! Thanks Loryl! I so wish I had Annabelles but have not had much luck. I have one that is small but I keep nudging it along! I’ve been making silk floral arrangements for years, but got a tip from a friend who enjoys working with naturals. 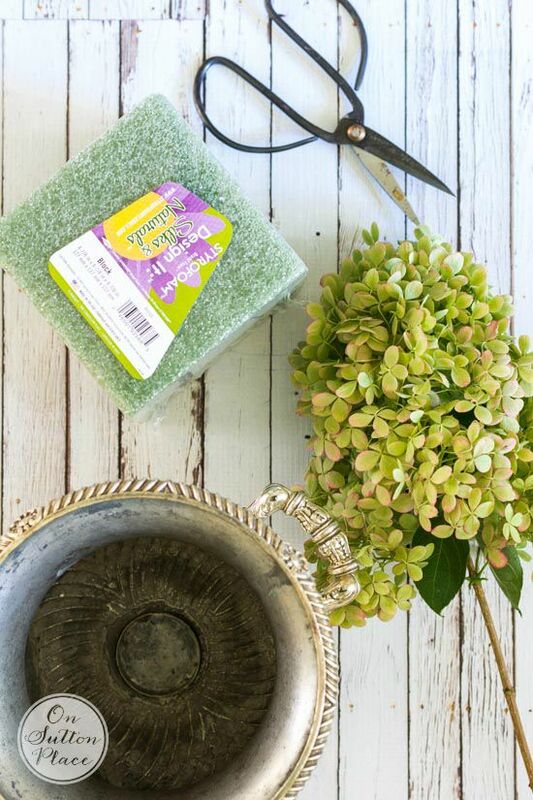 Switch to wet floral foam and those fragile natural stems won’t break! We have Endless Summer hydrangeas. I waited till this week to cut and dry them using the water method. 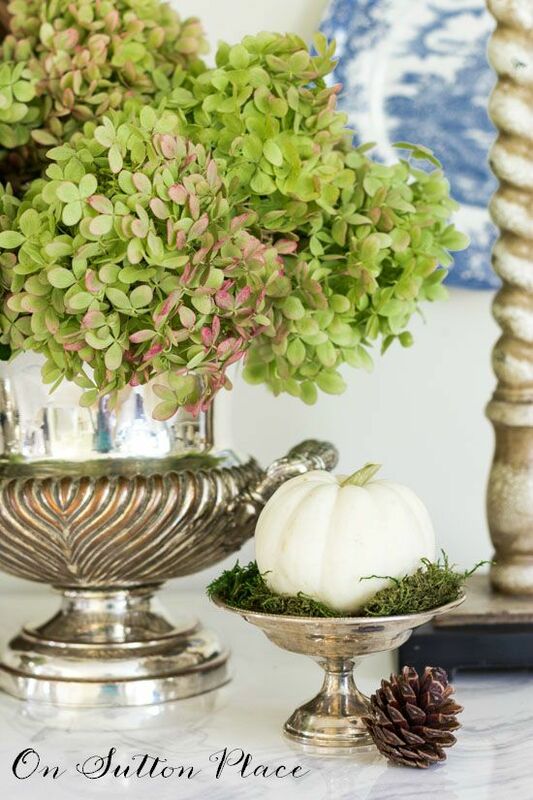 I cut last year’s dry hydrangeas’ stems short to fit my dining room’s fall centerpiece on my table. Thank you for sharing your tips on arranging these beauties. I’m anxious to see your wreath. The limelights are beautiful this year so much so I want to plant some in the spring or when I find a good buy. I have two hydrangeas but mine are blue. I have some hydrangeas from my son’s wedding 3 years ago. I try very hard not to move them too much but I have also sprayed them with hair spray and they seem to be holding together fairly well. Hydrangeas are my favorite flower especially in arrangements. Thanks for sharing. Beautiful. I have a picture of 3 huge dried hydrangeas from 2 yrs ago that still looks great!!! Beautiful arrangement. Lovely containers. Your posts are a delight. Thanks for the silver cleaning tips. Such a beautiful project for the first day of Fall. I look forward to every post from you, always inspiring. Happy Fall Y’All! Thank you. What a wonderful suggestion for our limelights. 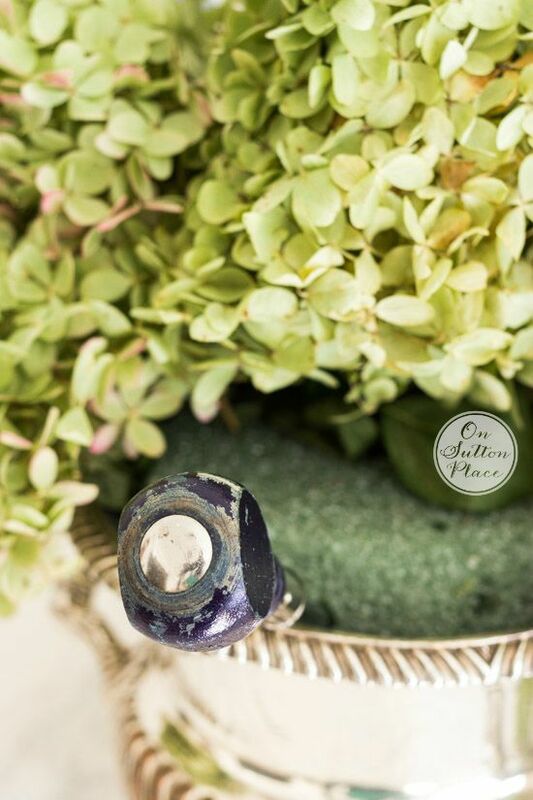 We have a charming champaign bucket and I hope to create your design today…. Now if I can only find the silver cleaner! May you have a lovely day full of Grace. You did not mention how you cut the hydrangea off the bush or when. Do I cut them when they are in full bloom or when they are starting to dry out on the plant. If I cut them in full bloom do i put them in water first etc….. Thanks! Hi Pam…wait until the blooms are drying on the plant. They will turn green with highlights of red. The blooms will look like very thin paper. If you cut in full bloom (late July) you will have to put them in water. That is exactly how I do mine, Ann. They are really beautiful this year and I have made several arrangements throughout the house. I love yours in the silver container.